We’re excited to announce our newest C2C CAL! 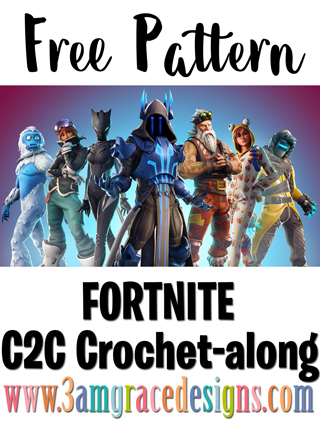 We’ve been hard at work designing a free crochet pattern for a 15 week Fortnite inspired blanket. The Supply List will release next Tuesday, 1/22/19 and our project will officially begin the following Tuesday, 1/29/19. Does the finished blanket look like the photo above? No. Much like our other C2C Crochet-alongs, we have incorporated symbols that we felt best represented the overall Fortnite game. Are you including ALL the symbols & characters from the game? No – that would be impossible. Fortnite is a huge collaboration of characters, symbols, emotes — the list is endless. We did our best to include what we felt was most important. Mini C2C. But you are welcome and encouraged to use whichever method you like best. Just keep in mind, each method produces a slightly different size so your overall product will vary depending on which you choose. Need to find, actually make time to do this, never know what to make for my older grandsons and this should be perfect. Do you have an approximate size? Hi Michelle! The project is 100 pixels wide. Your individual size will be determined by the method you use (Mini C2C, Regular C2C, etc.) your yarn weight, tension with which you crochet, and hook size. The length will be determined by the bonus panels you choose. Yes! Definitely joining in on this💕 My kids will be ecstatic!! So excited. My 10 yr grandson lives and breathes Fortnite. My only concern is that I’ve never done C2C. We have a great How-To section on our Blog to help! Also, we are active in our Facebook group to help. If you’re not already a member, we’d love to have you! Omg can wait to see it ! I’ll do my best to do that one ! My husband is a huge Fortnite fan , with Father’s Day and his birthday this summer this could make a great gift ! Haha! Can’t wait to see them! The patterns will be posted here on the Blog every Tuesday for 15 weeks. You are welcome to sign up for our email list and/or join our Facebook group where we post reminders. Hello I was wondering where do we find the list of yarn we need please? Hi Becky! The Supply List will be released next Tuesday! My 20 something son was just talking to me about Fortnite….I think he might like this afghan! My grandson plays this game I hope I can get yarn I would love to make this. Oh. My. Gosh!!! I only found your site yesterday! I saw your fox C2C posted by Oombawka Designs in one of her roundups. I’m so glad I did. My grandson will be THRILLED with a Fortnite afghan! I can’t wait. So glad you found us, Teri! Is this a video cal ? And I will love to do this for my grandson but I have never done a c2c. Yay! That makes us so happy! Awesome! We’re excited to have you! Be sure to join our FB group. We’re active in there daily helping out! So excited for this, my son is going to lose his mind. Thank you. Yay!! Can’t wait to see yours! Yay! Glad to have you, Sandra! Yes! Both my boys and my nephew live Fort nite. I’m in… Can’t wait to do this one. Thanks for the chance to do this project. You’re very welcome! Glad you found us! Yay I would have to make two ✌️ I have a 15 year old stepson and my 10 year old son both fortnite addicts which I don’t mind it’s way better then GTA and all that rubbish. Will the patterns be available to buy before the 15 weeks are up? Hi Britt! Awesome can’t wait to see yours! To date, we’ve never sold them. We just release them for free on the website. I have never crocheted a C2C but am really looking forward to learning now for this project. My son will love this blanket! You can do it! We have several helpful videos and a Facebook group that we answer questions in! I am so excited for this CAL. Never have done a c2c so it might be a little difficult. My 4o yr old son ia a HUGE FortNITE fan. Awesome Linda! Happy to have you! I’m new to website and can’t figure out how to get to this pattern. Can you only win it? I was hoping to cal. At row 31 on the banner, you start decreasing at the top right corner. This piece is a rectangle so you will decrease on one side and increase on the other until the opposite corner.